Who said florals were just for spring (which is pretty predictive I must say)? If you love all the feminine stuff, winter wear can be a bit lifeless and boring for you. But don’t worry, I’ve gathered here a little guide for when you want to feel like a lady when days are short and temperatures are low. 1. Try long dresses with dark blooms. Midi dresses in a dark colour with patterned flowers are one of your safest options, and one that you’re going to find everywhere, from Zara to Gucci every autumn/winter. They look very elegant and polished and it’s very easy to create very different looks with them: try a white sneaker and a leather jacket for a more casual look or pair it with a black bootie and a fur coat for a more formal occasion. 2. Wear summer florals but wrap yourself up. Saying this out of experience, it’s very difficult, when the temperatures start to drop, to store in a box some of your spring and summer items. And for me, leaving behind floral blouses is a true pain. But good news: you can still wear them! Make sure you cover up from the cold, and that the colours aren’t too summery. Keep all the reds, and the blacks and pair them with dark accessories for a risk-free look. 3. Go out there with the print. If you’re feeling fierce, floral prints in winter are the way to go. And especially if it’s not your traditional chiffon black midi dress but a pair of huge palazzo pants with a bold colorful floral print. Want something unexpected? A kimono-style cover-up in a bright colour, with a statement flower print is a great idea. Just make sure the rest of the look is more minimalistic and pair it with an all-black ensemble. 4. Keep it simple. If you’re not sure of how florals are going to fit into your winter wardrobe, there are lots of ways to wear them without being very noticeable. 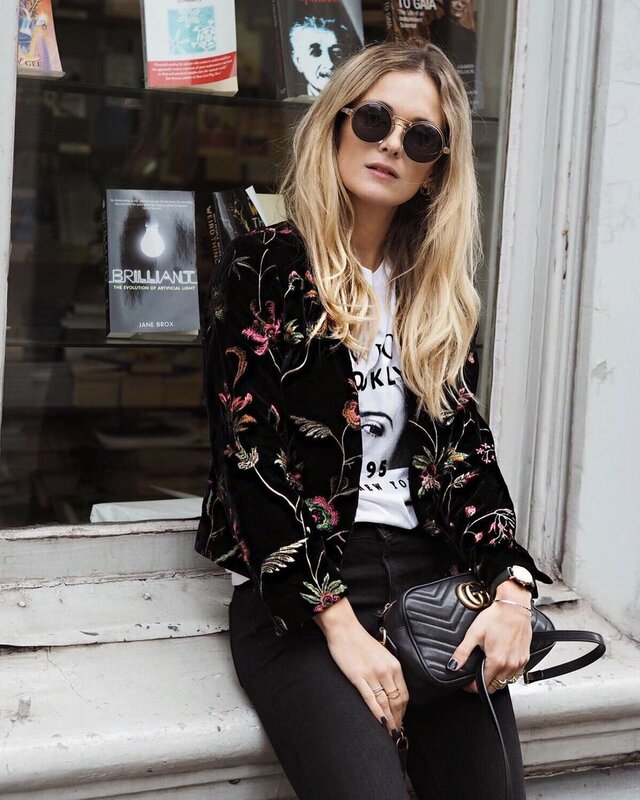 A blazer with a floral print and a black fabric, paired with your usual winter outfits (jeans and a t-shirt will do), looks amazing and it isn’t too out there. And you can always layer up a floral t-shirt and just make it peak and add a little accent to any rather plain outfit.